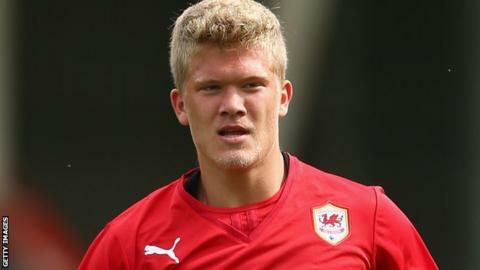 Cardiff City striker Andreas Cornelius says he is close to full fitness after what he describes as a frustrating spell on the sidelines. The Dane, 20, joined from FC Copenhagen for a then club record £7.5m in July. He has only featured twice this season and has been out of action since August with an ankle injury. "It's always hard to watch your team play when you're not able to play and you want to contribute and do the best you can," he said. "When I knew it would take a long time I was a bit frustrated but I've learnt a lot from it and done a lot of work in the gym. "Hopefully I'll get back stronger than before." Cornelius suffered an ankle injury during pre-season training but made his Premier League debut as a late substitute in the 3-2 home win over Manchester City. He started the following match against Accrington Stanley in the Capital One Cup but was stretchered off with an ankle injury. The Danish international played 60 minutes in a behind closed doors friendly at Yeovil Town last Thursday and hopes to be involved in Sunday's Premier League home game against champions Manchester United. "I'm ready to play and my ankle is better," said Cornelius, who recently won two awards at the Danish FA's annual awards. "I played in a friendly with no problem so it's getting better. "I hope to be involved and I'll just try and work hard this week and show that I'm ready to be involved." Cornelius was the top scorer in the Danish Superliga last season with 18 goals and signed a five-year contract with Premier League newcomers Cardiff during the summer. The £7.5m was at the time Cardiff's record transfer fee and although that has now been surpassed by Gary Medel, Cornelius insists he will not let the fee affect him. "I don't think about the price tag," Cornelius told BBC Radio Wales Sport. "I can't think about how much they paid for me I just need to do the best I can and hopefully the fans will like it and the manager will like it."